WASHINGTON — For Democrats, there's something deeply satisfying — perhaps even cathartic — about personalizing their attacks on President Donald Trump. And they've been doing it with relish, particularly after he said last week that they had acted "un-American" and even "treasonous" by declining to clap during his State of the Union address. Borrowing a page from Trump's celebrity feud playbook, Sen. Tammy Duckworth, D-Ill., a war veteran who lost her legs in Iraq, has given the commander in chief a nickname: "Cadet Bone Spurs" — a reference to the service deferments Trump obtained during the Vietnam War. "He's a joke," former Vice President Joe Biden said when told the White House had written off the treason remark as a stab at humor. Within the last few weeks, House Minority Leader Nancy Pelosi accused Trump of trying to "make America white again" with his immigration plan, and former Virginia Gov. Terry McAuliffe said he'd flatten Trump if the president got in his physical space. These Democrats are fighting fire with fire. But others think it's bad form and worse strategy to copy Trump's brand of highly personalized and harsh speech. It would be hard for Democrats to overshoot the mark with their deeply anti-Trump base. But they are also aware that they need to attract independents and some Republicans if they are to win big in this year's midterms and recapture the White House in 2020. Ben LaBolt, a former White House and campaign aide to President Barack Obama, said that while Duckworth has special status to confront Trump on his military deferments because of the sacrifice she made, it is more broadly a mistake for Democrats to engage in nasty personal attacks on the president. "Democrats want to see leaders with the fortitude to stand up to Trump, but you can't and shouldn't try to out-Trump Trump," he said. "We can lay out a strong contrast while being honest, credible and empathetic towards Americans from all backgrounds. Besides, who would want to mimic a president who can't seem to get 40 percent of the country to support him?" This is hardly the first time politicos have had to deal with how best to combat Trump's name-calling, but the issue has taken on new urgency as the midterm elections approach. Trump used "Low-energy" Jeb Bush, "Lyin' Ted" Cruz and "Little Marco" Rubio during the 2016 Republican presidential primaries and "Crooked Hillary" Clinton in the general election. Though she tried to convince the American public that Trump wasn't temperamentally fit to serve, Clinton chose not to stick him with a nickname. But Rubio, in some of his last, desperate hours on the campaign trail, called attention to what he said were Trump's "small hands" — a proxy for masculinity that was lost on exactly no one. "I don't think we'll win a street fight with Trump in slinging accusations back and forth," said Rep. Ro Khanna, D-Calif. "That didn't work out so well for Marco Rubio. Instead of being consumed with attacking Trump, we need to be consumed with solving the real problems of the citizens and nation we represent." Indeed, some Democrats think there's a big risk of losing their message if they engage in hand-to-hand combat with the president in a personal way. "I do not think it is helpful or in the best interests of Democrats to stoop to the level of the rhetoric that the president has introduced into the national conversation," said Symone Sanders, who was press secretary for Sen. Bernie Sanders' 2016 presidential campaign. "Democrats have to be stealth and steadfast about always bringing the question back to the issue at hand." Still, talk of treason — joke or not — sharpened the swords of Democrats who feel they have the credentials to attack Trump on military issues. "They would rather see Trump do badly, OK, than our country do well," Trump said of Democrats who sat on their hands during his State of the Union address last month. "They were like death and un-American. Un-American. … Can we call that treason? Why not? I mean, they certainly didn't seem to love our country very much." Treason, a crime punishable by death, is defined in the Constitution as waging war against the United States or providing aid and comfort to its enemies. Trump's use of it as a political weapon didn't sit well with Democrats, particularly those who have served, and sacrificed, in war. Duckworth used Trump's favorite medium, Twitter, to respond. "We don't live in a dictatorship or monarchy," she wrote. "I swore an oath — in the military and in the Senate — to preserve, protect and defend the Constitution of the United States, not to mindlessly cater to the whims of Cadet Bone Spurs and clap when he demands I clap." 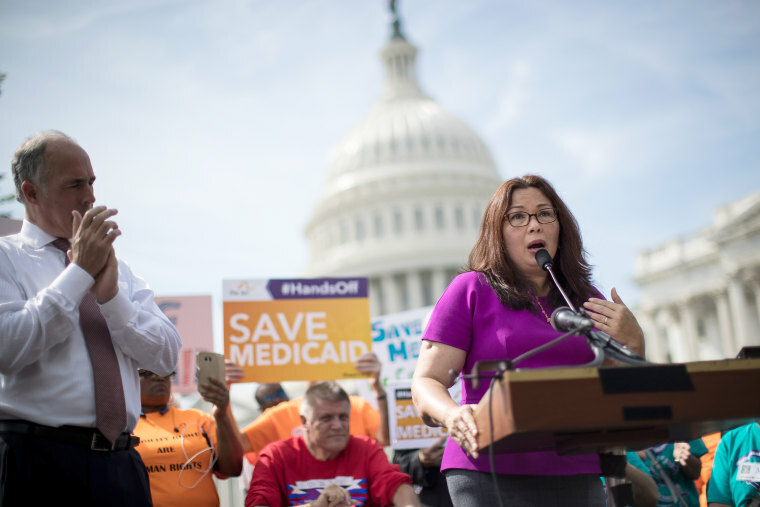 Duckworth had first tagged Trump with the sobriquet in January, after Trump accused Democrats of shutting down the government at the peril of the military. Sen. Jeff Flake, R-Ariz., added a touch of bipartisanship to the backlash against Trump on the Senate floor Tuesday. "Treason is not a punchline, Mr. President," Flake said, as he called for civility and the observation of norms in Washington. Democrats have been trying to walk a similar tightrope. For nearly two years now, they've rejected Trumpian speech as divisive and beneath the dignity of federal office. But they also don't want to be punchlines or punching bags for the president. And yet because Trump won in 2016, and his base hasn't seemed to have eroded, there's a temptation for some Democrats to think copying elements of his style could work for them. Sanders said Trump won despite his manner, not because of it. "I reject this notion that his brash rhetoric got him elected," she said. "Democrats absolutely shouldn't just sit there and take the president's beating," but they should push back on offensive commentary and then quickly "elevate the conversation." Patti Solis Doyle, the first campaign manager for Hillary Clinton's 2008 presidential bid, said Democratic candidates can't just fight fire with fire because it doesn't fit their brands. "The problem is, of course, that this tactic doesn't come naturally or smoothly for many of the elected officials," she said. "It isn't authentic. Authenticity is critical for anyone running for public office. Trump is authentically a jerk and has therefore been able to get away with his name-calling." "In fact, his base loves it."